I have to hand it to my neighbor in the Liverpool neighborhood of Galeville. He makes the most of a newly arrived golf cart, parked on his front lawn to haul away autumn this-and-that from the pretty gardens always well-tended by he and his wife. He put the pieces together for his mom, he told me, for her camp up north. She gave up the property, and told him he ought to take the cart. Their son will have fun driving it on the grounds of the Salina Town Hall as he nears his teens, the figures. The pink flamingos stay in the garden, I hope. And the corner lot political signage has until Election Day, I’d figure. What to do with that bothersome water pipe? You sure got that right, Beth. He has the right idea. We have a lot of senior communities here, where the golf cart has replaced the car for so many. I kinda like that ! They’re definitely more energy efficient, Van. I like that part of it. 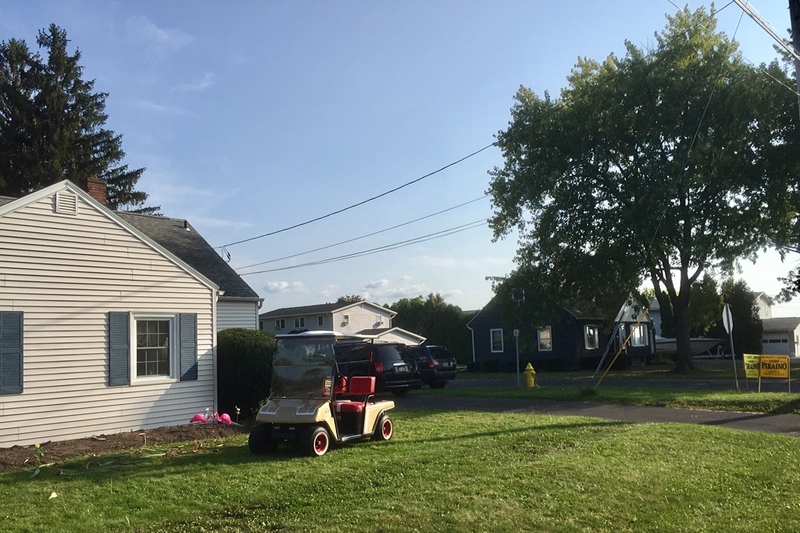 I could use a golf cart at my new house – and a riding mower. We’re working on the mower situation, but I doubt we’ll ever get the golf cart. I’ll just have to keep chasing Puppy Cody around on foot. Ha! We get the fence next week. Then Cody can chase bunnies and squirrels to her heart’s content. I can hardly wait.